Karen Ford, daughter, Danielle Worrell and son Eric Ford operate Goodness Gracious at the Mill. On the site of the historic Readyville Mill awaits something new and scrumptious, a feast for the eyes and the palate. My goodness gracious, it’s nothing less than Goodness Gracious at the Mill, a reincarnation of the Boro’s former Goodness Gracious Café. Restaurateur Karen Ford relocated her marvelous menu, kitchen and catering business here in March, and gourmands and hungry hombres alike are finding the entrees and desserts lip-smacking good. Ford’s motivation for the 12-mile shift in operations was about a lifestyle change but not about changing the vocation she loves. The original Readyville Mill, established in 1812, burned in the 1860s. The current four-story, poplar mill went up in the 1870s and was a water-powered, stone-ground grist mill until it was shuttered in the 1970s. Entrepreneur-carpenter Tomm Brady bought the mill in 2006 and restored it as a labor of love before selling it to Ford early this year. Ford found she had to make but a few alterations for her restaurant to fit right in. Fans of Ford’s former café in Murfreesboro will be glad to note, her menu has been altered little as well. “It is still basically the same, and we incorporated what Tom had done with mill products and mill menu items. We put the two together,” she said, referring to the Saturday morning pancake breakfasts that Brady began serving several years back as well as selling grits, flour and corn meal made in the mill. For breakfast, brunch and lunch Goodness Gracious offers a variety of pancake items, omelets, benedicts, sandwiches and quiche. When open in the evening the main fare is fried chicken, catfish and several Polish dishes, which reflect Ford’s heritage. All the desserts, from red velvet cake and Snickers cake to Italian cream cake and the pies prove winners. On a recent Saturday morning, Murfreesboro’s Kevin and Destinee Mabin and their daughter Kayla enjoyed a brunch consisting of a BLT with gouda grits, a corncake omelet with eggs, corn, strawberries with homemade cream cheese and almond tea and fruit tea. Also dining at the riverside restaurant Murfreesboro Central High School class of 1964 alumni Beverly Lamb of New Orleans, Pamela Eakes of Seattle and Shirley Stagner of New York City. “I had a beautiful breakfast with country ham and biscuits,” said Eakes. “It was like getting our tomato fix,” said Lamb. “It was all very impressive. We couldn’t eat dessert. We’ll be back,” promised Stagner. The accolades for the food do not go to Ford alone but to her children who serve by her side. Son Eric is chef and miller, and daughter Danielle Ford Worrell handles correspondence and paperwork among other chores. Ford, a native of Detroit, Mich., and Bob, her husband of 37 years, and their children moved to Middle Tennessee in 1989 when he took a job with Saturn in Spring Hill. 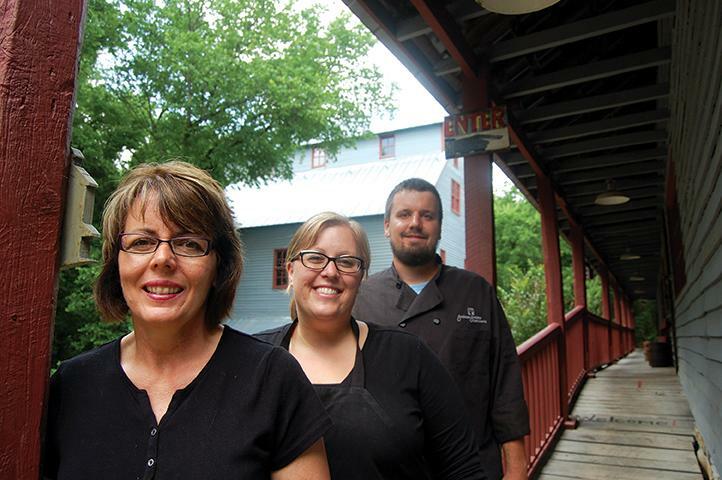 She started her culinary career at The Front Porch in Murfreesboro in the early 1990s. When owner Debbie Barner sold that restaurant to purchase Miller’s Grocery in Christiana, Ford and some friends bought The Front Porch and operated it from 1992 to 2001. “I attribute Debbie to being the lady who helped me to become passionate about food and catering,” said Ford. “She worked so hard at it. She made food look like art, and I thought that is something I was interested in. After The Front Porch, Ford operated Cherry Tree Catering Company and discovered that her children, who helped but did not really enjoy the restaurant business during their high school and early college years, had a change of heart. “They said they missed it and now had fallen in love with it. At that point we opened Goodness Gracious,” she recalled. Her role at the mill eatery includes a lot of things but she looks forward to pulling off the day-to day-operations. “That I get to focus more on the catering aspect and not have to be open six days a week, loving what I do but not spending 80 hours a week doing it,” she said. Meanwhile, the mill produces freshly ground white and yellow cornmeal, wheat flours, white and yellow grits and oatmeal. There are bigger plans for the Readyville Mill venue, especially in the direction of matrimony. Karen and Bob became Readyville residents two-and-a-half years ago when they purchased The Corners, a brick mansion built by George Ready in 1829. Karen discovered the estate searching for a house online. “My husband and I lived in Rockvale in the house we built when we moved here. Our children grew up there and had moved out of the house. We were going to downsize and moved to the city. I hated it in the city,” recalled the Motor City native. The Fords rent The Corners on the River and its grounds for weddings, private parties, bridal teas, rehearsal dinners and corporate events. The house can handle up to 60 guests, and events just on the grounds can handle 150 to 175 people. “It is a very historic home and has a historic presence. We have tried to keep it as close to period décor as possible with antiques but with nice modern conveniences as well. Most people are charmed by it. It’s peaceful, quiet, lovely. “My husband and I try to sit outside as much as possible and enjoy the grounds and the river and the charms of it,” said the businesswoman, who really may have found the best of both worlds.